I’ll admit I’m mildly obsessed with making shiny trousers. 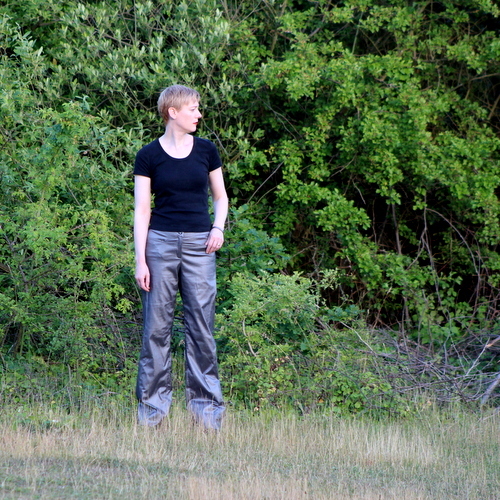 Up until now my experiments have all been skinny jeans made from Burda 103-07-2010. 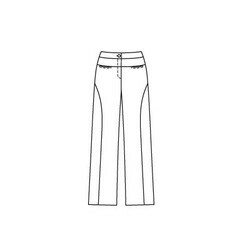 This however is Burda 115-12-2009, a pattern for wide legged trousers with interesting curved seams. Sadly I can’t find it in the Burda online pattern store or I’d link to it. The technical drawing will have to do. What you can’t see on the drawing is that here are no side seams; the side front panel wraps round the back to the inside leg seam. I always think trousers look better with a bit of detail on the back. The curved yoke seam on these is much faster to sew than back pockets but has the same effect of breaking up the expanse of backside. And I never use back pockets anyway. Instead there are nifty little inseam pockets in the front yoke. They look lovely but they’re unfortunately a little on the small side. OK for keys and cards but I wouldn’t get my phone in them. 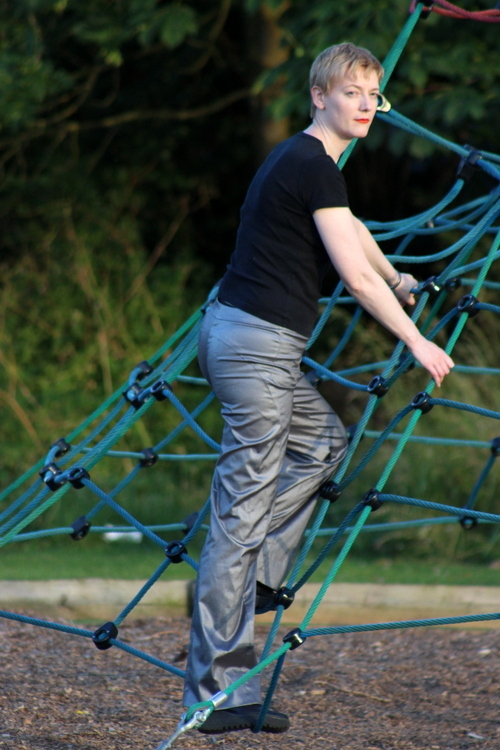 The trousers are made from yet more of the metallic stretch twill fabric I got from Truro Fabrics recently. Technically speaking it’s not a great choice for this style. The shine means that every single wrinkle is hugely visible. I swear they’re not too small – they feel fine on – but in these pictures they certainly look a bit clingy. I think the pattern was intended for a sturdier fabric. The pattern instructions simply say ‘trouser fabrics’ (thanks for that insight, Burda!) but the finished garments in the magazine are made from gaberdine and corduroy; ie heavier weight than my twill and lacking stretch. This all sounds negative, but in fact I like my version a lot. I was going for a practical style with a twist; a colleague described them as looking ‘industrial’ which on reflection I think is a success. 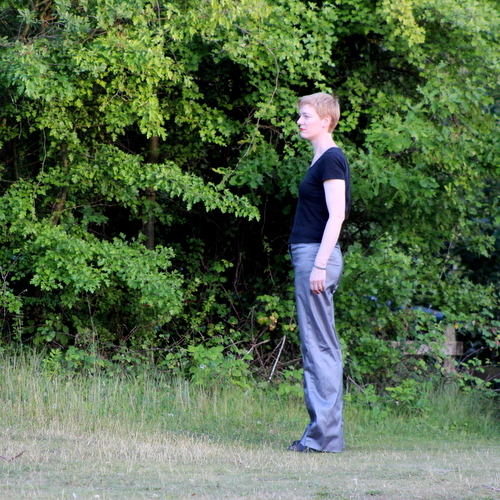 One thing I still haven’t got the hang of with Burda is how much length to add to their trousers. I know exactly how much length I need to add to bodices for Burda, and based on that plus the difference between my height and the height they design for I should be able work out exactly how much length to add to the legs. But it always comes out too much. I took an inch off these before hemming them and I’m wearing them with platform boots here. Still, better too long than the opposite. I know I should just add less to the length, regardless of calculations, but I’m always paranoid that the next pair are going to be the ones to come up disastrously short. These seem to be passing the wearability test with flying colours. I’m keeping them for work because of the pockets – I still don’t have enough clothes with pockets – but I’d happily wear them at the weekend too. I might make this pattern again one day. There’s an alternative view with combat trouser details (side pockets with flaps, bellows pockets on the thighs, belt loops) which I’m quite tempted by, to the extent that I’ve traced off the extra pieces. Might have to go up a size though! 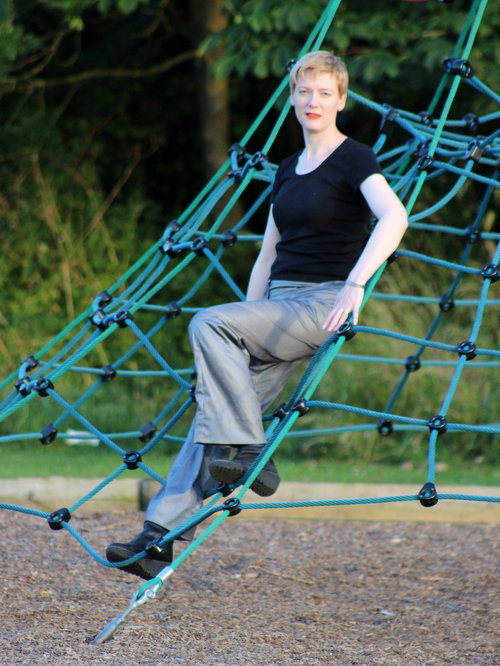 Posted on July 4, 2015 July 4, 2015 by catherinedaze	This entry was posted in burda, dressmaking, Finished, sewing, Silver, trousers and tagged burda, dressmaking, sewing, silver, silver trousers, trousers. Bookmark the permalink. Not seen trousers with that type of shape to the seams. These are great, love the fabric- fun. Love them! I think the description of ‘industrial’ is a great compliment. They look so chic and different. More please! I agree… the industrial description is perfect and complimentary. I think you carry them off very well. Great lines in this pattern.